Roosevelt had (wisely) commandeered/converted some factory production before America's entry into the war, so that might explain a pre-war shortage? Any idea of the time period? The feet are painted wood with nails affixing them to what I also believe to be a wood case which is covered with decorative textured paper. 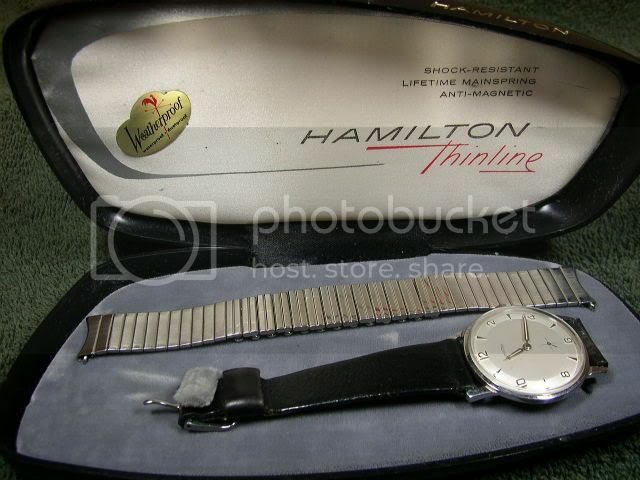 It says "Hamilton" on the outer lid, though it is faded somewhat, and has the ribboned name inside as well. The interior base is lined with blue velvet. I don't recall seeing any responses to this post. Would a 1933 Putnam have been presented in this or were the bakelite boxes in play by then? inatime wrote: I don't recall seeing any responses to this post. Would a 1933 Putnam have been presented in this or were the bakelite boxes in play by then? Funny you should mention that box, I glanced over at it the other day and was thinking that it was the next mystery that we should solve. So I assume, this coffin box still was available in 1935. Maybe this box really would a good candidate for a Putnam. Excellent, we are getting closer! Now I need to find one or both of these. Mugea wrote: So I assume, this coffin box still was available in 1935. Maybe this box really would a good candidate for a Putnam. GREAT FIND, MARTIN! Thanks so much!!! Here's my newest, an early Thin-o-matic box of 1959 I recently bought from René via ebay (I guess and hope, the other boxes René sold will be presented here soon). Filled with a T-501. René described it as a 1959 box , but I guess, this box was used for the thin-o-matics in 1960 also. It seems to me, the successor (the black asymmetric box) appeared late in 1960, early in 1961 - judging from a photo shown in "Timely Topics" Jan/Feb issue of 1961. P.S: just for Susan: a photo showing her some years ago - at least, I guess so. Or can you imagine any other girl/woman looking with such an excitement at a boxed Electric? When I saw Rene's boxes all lined up in my eBay watch list I thought that they made a great visual box timeline. I was going to ask his permission to use the photos and his titles/dates to cobble something together for this thread. Eventually. Looks like you made a great score: the photo of the set is smashing! So I scoured the 1938 catalog to see the Bakelite was introduced then, 3 years after the Putnam production. From the 1938 catalog: "this distinguished new box". While that quote is attached to the page showing women's models, I'm assuming as the Bakelite is shown further in the catalog with men's model and doesn't appear in prior year catalogs, I can assume it was introduced for men and women in 1938.
inatime wrote: So I scoured the 1938 catalog to see the Bakelite was introduced then, 3 years after the Putnam production. From the 1938 catalog: "this distinguished new box". While that quote is attached to the page showing women's models, I'm assuming as the Bakelite is shown further in the catalog with men's model and doesn't appear in prior year catalogs, I can assume it was introduced for men and women in 1938. Note also: the Contour is displayed in a normal box.